This time we look at a recent DVD release that has strong historic and cultural value: Linnaisten vihreä kamari (1945) is a peculiar phenomenon in Finnish film history. Just imagine setting up a horror film in the midst of WWII. 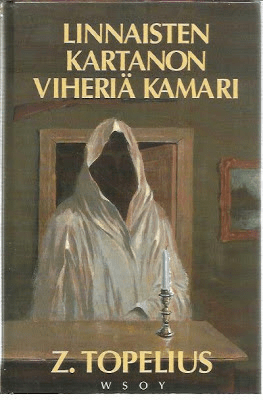 Consequently, Linnaisten vihreä kamari is not your ordinary horror film, if horror at all. Set in a beautiful mansion, it is a story filled with romance, secrets and grandeur. The pure escapism is heart felt. As we can imagine, people in the midst of war needed an escape from their gritty every day life. This is exactly what the film offers. And as much as we can figure out from the statistics, people enjoyed it. In Finland, Linnaisten vihreä kamari was the most watched premiere in 1945. The film is based on a novel by Zacharias Topelius, written in 1859. It is a classic romantic and even gothic ghost story, told here with extreme care, without any emphasis on the horror. But what the movie lacks in horror, it compensates with tone and atmosphere. Shot in black and white, the direction by Valentin Vaala is classy, the haunting play between lights and shadows continues throughout the film. The ghostly effects are produced with adequate style. As you can imagine, for the contemporary viewer, the effects are quite subtle and fairly outdated, but as such, the emphasis stays on the storyline. As a conclusion, I mostly loath movie remakes, but the deep and haunting story here truly deserves one. Released on DVD by VLMedia on December 4th 2015.